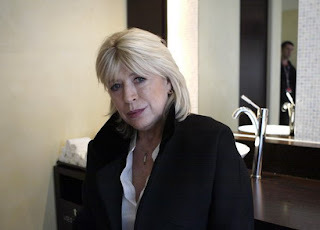 I don't know how or why, but I was reading about Marianne Faithful the other night. The name sounded vaguely familiar. 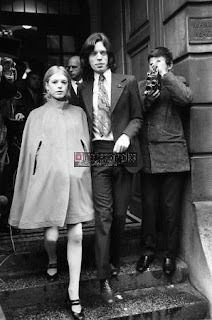 Turned out she was an English folk singer who got noticed by Mick Jagger, who then promoted her - and she became his girlfriend/lover from some time in the 1960's until 1970. 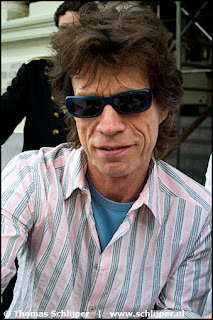 We all know Mick Jagger has been through tons of women. She was just one of them, almost a "first love" for him, although I think there were girls before her. He seemed to have been quite crazy about her for a long time by Jagger standards. Once their relationship was over, she fell apart. She became a street tramp doing drugs all the time, like a homeless vagabond. A few years later she pulled herself together and went on. This fits in with the delirium of youth. When you're young you think you'll live forever. Everything has the taste of drama and immortality, until you age a bit and reality hits. She still, today, has no remorse for the loose sexual behavior she exhibited back then. She admits to sleeping with many men, not just Mick Jagger. She "had fun" according to her present view. She is still an attractive woman, but the magic is gone, buried under the everyday-ness, the ordinaryness of her. After all, she has aged like we all have, and the "eternal" youth with it's excesses is long gone. Mick isn't looking so good these days either. We all age. The magic of youth doesn't last. Even the richest among us are subject to the limitations of this body and time. I wonder how they can deal with the passage of youth without the promise of eternity, without the grace of God. It all seems so sordid and sad, when looked at from middle age. Youth, being beautiful in itself, gilds the sin and makes it appear palatable, understandable. Age just makes it all look tired and vain and empty. I wonder - didn't Mick Jagger worry about her - try to make sure she was taken care of when she lived on the streets? I don't suppose any of this matters, but to me, it's just a symbol of what total antinomianism will do - like Solomon, who let it ALL hang out and seemed close to suicide in Ecclesiastes, without God there is no meaning at all to this "life".